The Decimal Suite’s budgeting, forecasting and projection solution also has reporting and profitability management capabilities that enable it to address commonly occurring issues in financial institutions, cooperative networks, investment companies, banks and insurance companies. The DECIMAL solution enables these organizations to improve their budgeting process, understand their cost structure and generate real-time data analyses and results. At the end of the day, this adds up to improved decision-making for you and for your organization! Cost-driver Planning and Budgeting – Payroll Planning and Management Progression Simulation – Budgeting for Projects Management – Budgeting for Assets Management. WHAT FEATURES DO FINANCIAL SECTOR ORGANIZATIONS WANT IN A BUDGETING, COSTING AND ANALYSIS SOLUTION? Budgeting and Forecasting – Reduces the budgeting and forecasting cycle, increases the quality of information generated and facilitates analysis of the results. Planning and Payroll Management – Simulates changes in the workforce and optimal allocation of resources in budgets and forecasts. Project Budgeting – Tracks the budgets of different projects. Capital Budget – Handles the amortization of existing and future assets. Product and Service Costing and Profitability – Creates better understanding of cost structure among managers, enabling them to benchmark results from different business units, justify internal (shared service centres, for example) or external pricing and create scenarios to analyze the financial impact of various initiatives on the cost of products and services. 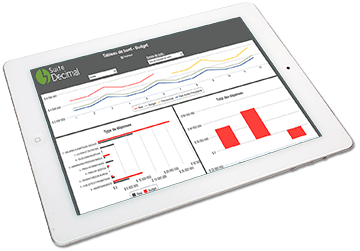 Financial Dashboards and Management Reports – Produces on-demand, up-to-date reports that can be viewed on office computers, laptops, or mobile devices such as tablets. Generally speaking, the department using the solution is independent and does not need to call on IT to make changes such as: adding a responsibility centre, changing the organizational structure, developing a new report. Is your budgeting process aligned to the services that you offer? The integrated budgeting, costing and BI solution for the financial sector. Listen to our expert give you some interesting leads to optimize the budget process in the financial sector (in French).